Friendship Day is the perfect occasion to express your love for your friends and reach them with your warm wishes and greetings. Friends share the bond of love and trust and are the most precious asset of everyone�s life, so they deserve the most touching Friendship Day cards that convey deepest feelings in a very special manner. Happy Friendship Day greetings express a variety of emotions which are blends of memorable photographs, poetry, thoughts, humor and jokes. If you want to send special Friendship Day wishes to your friends with a touch of affection and love, you can easily design a printable friendship cards or e-cards for your friends with the help of greeting card creator. The greeting design tool enables you to design personalized greeting cards for your dearest friends. Happy Friendship day wishes are always written and read in a special way and the software enables you to express your warm feelings without putting in much efforts. Add humors lines to share laughter with your friends. Insert jokes to make your friends laugh. Add a memorable photograph to make the card look more personalized and unique. 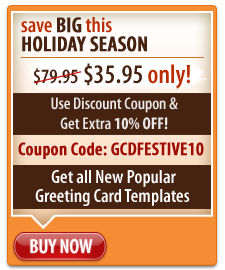 So, buy this easy to use greeting design software now and design personalized cards in a simple and effective manner. Send these e-cards to your friends and tell them how special they are.